Arriving in Paris in 1784, Jefferson began equipping himself for a lifetime of lively entertaining. Among his first purchases were two dozen silver forks and spoons, in a variation of the popular fiddle and thread pattern. He brought them home to Monticello and used them the rest of his life. 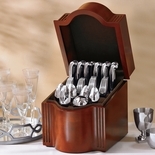 The original French pattern has been handsomely adapted to the modern table by Reed & Barton in 18/10 stainless steel. The 40-piece service for eight includes teaspoons, place spoons, dinner forks, salad forks and dinner knives. In May 1784 Congress elected Jefferson minister plenipotentiary to France, and he moved to the exhilarating city of Paris for his diplomatic service at the Court of King Louis XVI. He quickly set about acquiring necessary household items. One of his first purchases was a set of silver spoons and forks, two dozen each. He had them shipped back to America with his other household furnishings in 1790, and used them at Monticello for the rest of his life. After Jefferson�s death in 1826, his flatware was distributed among four of his grandsons. Thirteen of the forks and four tablespoons have since been returned to Monticello, where they are on display in the dining room. They are in the common fiddle and thread pattern and most bear the marks of Parisian silversmith Louis-Julien Anthiaume. Today, adapted for the modern table, the Monticello collection brings old world grace and modern utility to any formal or informal setting.